Happy New Year to all. 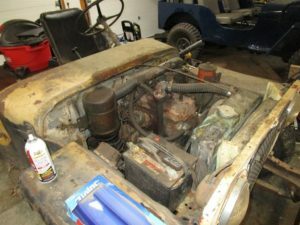 Here at FarmJeep.com we are starting the New Year off right with an old project and hoping for a year of old fashion fun. We started our journey in August 2002 with the purchase of a 1947 CJ2a we call “Old Yeller.” We knew that a body transplant was in our future even back then. Clearly something needed to be done. But as the story goes, that parts Jeep turned out to be a 3a that would become “Ole Blue” and it has consumed all our time and money for the past 15 plus years. Meanwhile, other than developing a smoking habit, Yeller has been our faithful working Farm Jeep. 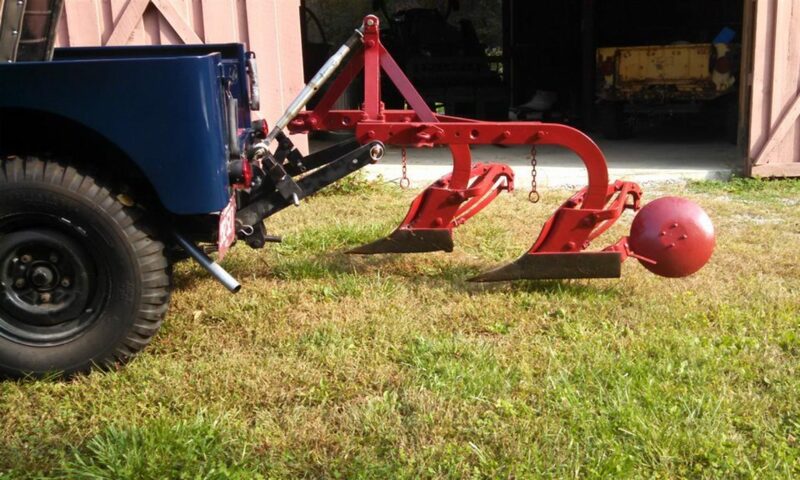 Over a year ago, our friend Craig (finder of Newgren plows) found a great deal on a complete reproduction body kit. We purchased the kit and immediately placed it in the barn. Blue was a “down to the frame” restoration. This time we will concentrate on building a work Jeep, not a road worthy “show” Jeep. Plans over the next couple of months include removing the motor and the old body. We will have the engine overhauled while we will prep and paint the body. Blue had a professional paint job. As our friend John Ittel says, it will be a 20 foot job – looks great from 20 feet away. With the body off, we will clean and paint the frame and correct any major issue. Since we replaced all the brake hardware, we will just do maintenance work. We do plan to install a new clutch while the engine is out (makes it a simple process). Since acquiring the body kit, we have collected a new wiring harness. We need to gather all the other bits and pieces needed to install the body (nuts, botls, etc.). We will make a decision on gauge replacements on a case by case basis. Some gauges have been replaced over the years. Others, like the speedometer have been ignored. We will also be gathering information on installing the tub. Blue had a professionally prepared tub, requiring minimal body work. Based on the experience of others, as described on CJ forums, we will need to learn new metal working skills. The picture above shows that the first step has been taken. We removed the hood, the tailgate and tailgate chains. While we are confident we can have a working Jeep in a few months, we will take our time and most importantly have some fun. We hope to share that fun here. Stay tuned. Next PostNext Big Changes to FarmJeep.com!